I was unfashionable before anyone knew who I was. 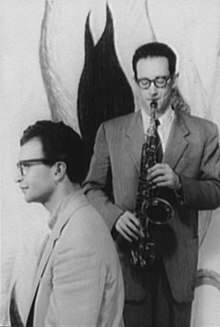 Paul Desmond (25 November 1924 – 30 May 1977), born Paul Emil Breitenfeld, was a jazz alto saxophonist and composer born in San Francisco, best known for the work he did in the Dave Brubeck Quartet and for penning the group's greatest hit, "Take Five". I could only write at the beach, and I kept getting sand in my typewriter. I hate the way he writes. I kind of love the way he lives, though. I have won several prizes as the world’s slowest alto player, as well as a special award in 1961 for quietness. I think I had it in the back of my mind that I wanted to sound like a dry martini. I tried practicing for a few weeks and ended up playing too fast. It's like living in a house where everything's painted red. Well, that I'm not playing better. Writing is like jazz. It can be learned, but it can’t be taught. You're beginning to sound like a cross between David Frost and David Susskind, and that is a cross I cannot bear.